After earning his pilot's license at 17, Michael Ebanks decided to major in aerospace engineering at Texas A&M University to put himself one step closer to working for NASA. 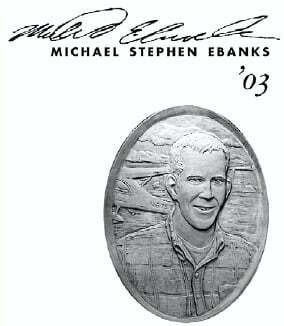 Michael was one of the 12 Aggies who died in the 1999 Bonfire collapse. Chip Thiel, who was injured in the 1999 collapse, wipes away a tear during his speech. Jerry Ebanks, the father of Bonfire victim Michael Ebanks, looks on. This is the third in a series of stories about the 12 Aggies killed when the Texas A&M University Bonfire collapsed in 1999. These stories stand in tribute to the lives lost and those forever changed by the tragedy. A ceremony to dedicate the Bonfire Memorial on campus is scheduled for Nov. 18, the five-year anniversary of the collapse. When Michael Ebanks was in high school, he dreamed of becoming an astronaut or an airline pilot because he loved anything that flew. 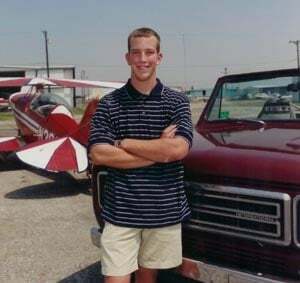 His father, Jerry, said Michael worked three different part-time jobs to pay for flying lessons. He even found creative ways to earn the money. Jerry and his wife, Bulinda, find comfort in those memories as they continue to cope with the death of their youngest son, who was killed in the Nov. 18, 1999, Texas A&MUniversity Bonfire collapse that took the lives of 11 students and one former student. It was a loss too unthinkable to bear considering what the Ebanks family already had been through. Their oldest son, Keith, who graduated from A&M in 1989, was killed in a car accident five years before Michael died. Jerry said that families never get over losing a child, but the incredible support of family and friends makes the grieving process easier. “We still miss him, and we miss Keith, too,” he said. “But we’ve got all we need of family and friends, and that does the trick. However, Jerry said that 19-year-old Michael was such a vibrant person that keeping his memory alive is the easy part. The family still keeps in touch with many of Michael’s friends and has scores of letters, A&M paraphernalia and pictures of their sons in a bedroom in their Carrollton home. At 17, Michael earned his pilot’s license and could recite the history of NASA, Jerry said. To take one step closer to working at NASA, Michael decided to major in aerospace engineering at Texas A&M, which was the only school he applied to, Jerry said. He added that what helped solidify Michael’s decision to go to A&M was the fact his older brother, whom he respected, graduated from the school. His parents take comfort in the fact that Michael loved Bonfire so much, his father said. Michael often would travel to College Station to visit Keith, who also worked on Bonfire. Michael saw Bonfire burn two times prior to attending A&M. The morning of Nov. 18, 1999, Michael’s sister, Cynthia, was about to return to Texas from a business trip in England, and she told her dad that when she woke up, something did not feel right. “She said she was in a funk when she got up and her mind was all messed up,” Jerry said. “She just wasn’t herself, and that was about 8 a.m. [England] time, just about the time of the collapse. A young woman named Robin, who was engaged to Keith when he died, called the Ebanks family at 6:30 a.m. to let them know Bonfire had crashed to the ground and an unknown number of students were dead. After they did not hear from Michael, they made the three-hour drive to College Station from Carrollton. Michael’s lifeless body was the 11th pulled from the stack. The family has followed the progress of the Bonfire Memorial, making the trip two weeks ago to get a look for themselves at the 12 rectangular portals and 27 granite stones along the Polo Fields, which is the spot where the 2 million-pound structure fell. Each portal opens to the center of the Memorial and faces the hometown of the Aggie it honors. “I think it’s great,” Jerry said of the memorial. “When we first saw the design, we were not too excited about it, but it is a lot more elaborate with all the Aggie symbolism, so we began to get real excited. The memorial also contains a sculpture of each Aggie, and the artist used Michael as his guinea pig, Jerry said. They missed the final walk-though scheduled for any of the families who were interested a few weeks ago, but they said they look forward to seeing the memorial at the dedication ceremony Nov. 18. The Ebanks family does not blame the university for the death of their son, Jerry said. Numerous scholarships are given out each year in Michael’s name, Jerry said, ranging from the Bonfire Memorial Scholarship to one given out by Michael’s old soccer association, where he played and refereed. Now, Jerry said he and his wife take one day at a time, and Michael is always on their minds, but it’s been a process and Jerry said they had to learn to deal with their grief.